Before I get to the ‘Using Feedback as the Lesson’ post, there are a couple of pedagogical reflections / questions I wish to highlight / discuss with you and hopefully, as its the holidays, you might comment? A recent research study by Durham University would suggest that quality feedback from teachers is more effective in raising grades than homework, uniforms and smaller classes. More specifically, it outlined that giving pupils clear and effective feedback was “very high impact for low cost.” If this is in fact the case, how best to use this feedback? How do you get students to really read your quality feedback comments and not simply make a bee line for the summative grade? Do you ever exclude the grade in order to encourage your students to focus on the feedback? (This is an enlightening exercise, I can assure you). If this is the case, when, if at all do you provide the grade? Is the time it takes you to write quality feedback fully exploited? If so, how is this achieved? Here is one technique to get more from the quality feedback you offer using the Moodle Gradebook export feature. After grading and writing the summative feedback into the Moodle gradebook, select export. Make sure you tick the ‘Include feedback in export’ option, de-select the unwanted assignments and export. In this example, I exported included two tasks, a self assessment checklist grade and the assignment grade and feedback. To create the lesson resource, I simply copy and pasted the information into WORD and removed the student name, leaving the checklist and assignment grade and summative feedback comment. 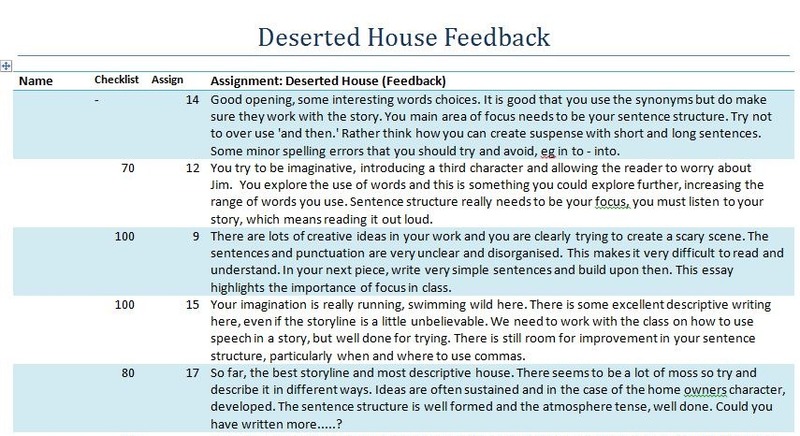 In the next lesson, given a copy of the assignments, students have to decide which feedback comment belongs to which submission, of which, one belongs to them. The subsequent lesson requires students to read not only their own feedback but also their peers. It calls into action a range of analytical and evaluative skills, that frequently leads to quite emotive learning debate. Significant negotiation and counter-argument skills follow as students vie for the highest grades on offer, in a game show style encounter. Although I have tried differentiated groups, top, middle and bottom grades, I have found mixed grade groups most successful, with the whole process adding real learning value to the time a teacher spends marking. This used to be highly valuable, but arduous lesson to prepare. Photocopying then marking the assignments, typing up or separating the comments, cross referencing the grades and creating the groups, but now…. with Moodle upload assignment and gradebook export feature it was access the print, grade, export and copy / paste to WORD. With the option to reuse the lesson resource with other groups. Have you used this technique before? What were your impressions? Interesting, after this post was published a respected colleague tweeted a question. ‘Do you share scores with all students?’ The answer was no, it was just within the groups however I am not sure the scores need to be included at all? They do stoke the debate but it’s got me thinking? The conversation / thinking surrounding this post continues. We currently auto-email the feedback to students but as yet students are not logging on regularly to collect the feedback, hence the lesson still works very well. If, however, students did regularly access their feedback, is there a way to delay that feedback reaching the students? Can the assignment be hidden and therefore the feedback hidden from view? What about the auto-email. Still to be investigated.